America’s obsession with soda has nearly doubled since the early seventies. According to the American Beverage Association, the average American drinks an estimated 54 gallons of soda per year – that’s about 19 ounces of soda per day. The average teenager drinks 31 – 42 ounces of soda a day. What if I said you could drop 26 pounds if you just drank one less soda a day? It’s true. A regular 20 ounce coke accounts for 250 calories. One coke a day doesn’t sound too bad until you add it up over time and realize it could mean a couple of dress sizes. One soda a day adds up to a whopping 91,000 calories over a year’s time – that’s 26 pounds of fat. “Liquid candy”, as many dentists call it, often times fall between the cracks when people begin a diet. Sometimes it is more obvious to get rid of unhealthy snacks, like cookies and donuts, and forget about what we drink. The truth is that a small can of coke has more sugar in it than most snacks. Although there are very few of us who would eat 10 teaspoons of sugar, we quickly drink it in just one 12 ounce can of coke. To help feed America’s infatuation with soda, manufacturers and fast food chains offer more variety and larger sizes than ever before. When coke products first came out, they came in 6 ½ ounce bottles and were considered a treat. Now sodas aren’t special at all but more like a staple in most homes. Manufactures have kept up with America’s demand for cola. Unfortunately though, more soda means more weight gain. If that wasn’t bad enough, now manufacturers have taken it up a notch introducing a large variety of “energy drinks”. What most people don’t realize is a lot of the “energy” coming from energy drinks comes from high amounts of sugar. Some popular energy drinks contain as much as twenty teaspoons of sugar in one can. What if you aren’t a coke drinker? You’d be surprised how many calories are in beverages most people would consider healthy. Cranberry juice is just one example of a high-calorie ‘healthy’ pick, having 18 teaspoons of sugar. Other popular juices like orange juice, apple juice and grape juice are actually higher in calories than an equal portion of regular soda. The bottom line is that you can’t forget how drinks affect your family’s waistline. There is nothing your body wants or needs more than water – especially living in Florida. Water should always be the go-to drink. Not only is it healthier for you, it can actually help improve the way you look. Bonnie Pfiester is a Personal Trainer, wife to the famous fitness trainer Steve Pfiester of the reality TV show “Fat March”, and owner of the women’s health club Longevity Fitness. You can enjoy more of Bonnie’s fitness and beauty articles at www.BonniePfiester.com or here at the kitchen table by visiting the Bonnie Pfiester page. Stay away from refined sugars and soft drinks, focusing instead on low glycemic index carbohydrates. Low glycemic foods include high-fiber fruits and vegetables, some whole wheat pastas and breads, and most nuts, while foods that you should limit or avoid include sugary cereals, high-sugar fruits, white enriched pastas or bread, parsnips, white potatoes, and most juices. Suitable replacements are whole-grains, fruits and vegetables, and foods rich in monounsaturated and polyunsaturated fats—including those that provide high levels of omega-3 fats, such as wild salmon and avocado. 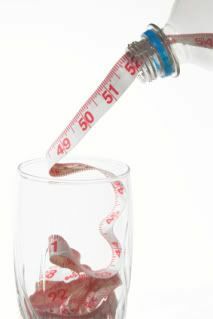 Of course, decreasing caloric intake by reducing portion sizes will encourage healthy weight loss, which also helps to improve metabolic abnormalities.For more healthy ways to control your blood glucose levels, download a complimentary wellness guide at http://www.dreliaz.org/metabolic-report.